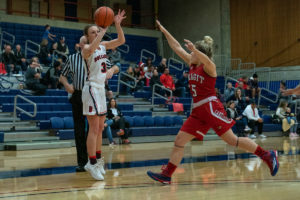 After a close first quarter, down 19-16, the Bellevue College women’s basketball team progressively ran out of enthusiasm and fight, losing 82-52 to Whatcom. The Bulldogs were outplayed in the second quarter and didn’t help their cause, turning the ball over six times in the period as the Orcas made shots from everywhere including the free throw line as they built a comfortable 43-29 lead at halftime. Amanda Luckett’s third quarter play kept Bellevue within potential reach as she scored six points and snagged five rebounds in a six minute stretch. Her efforts couldn’t be sustained by anyone on the squad in the fourth, as the Bulldogs’ 2-for-19 shooting in the fourth quarter turned the game into a blowout for the Orcas. Jahdai Alcombrack had 14 points for Bellevue. Luckett was the anchor of the team for the night, scoring 10 points on 5-for-11 shooting, and leading the ‘dogs with a game-high 13 rebounds, including seven offensively. Bellevue falls to 1-2 (5-10 overall) and returns home for their next game this Saturday January 19 at 4:00 p.m. vs. Shoreline.